Try entering “failure to replicate” in a google search (or better still, let me do that for you) and you will find no shortage of hits. You can even find a reproducibility initiative. Nature has a whole set of articles on the topic. If you live in New Zealand you have probably not escaped the coverage in the news about the botulism bacteria that never was, and you might be among those puzzled about how a lab test could be so “wrong”. Yet, for scientists working in labs, this issue is commonplace. Most scientists will acknowledge that reproducing someone else’s published results isn’t always easy. Most will also acknowledge that there they would receive little recognition for replicating someone else’s results. They may even add that the barriers to publish negative results are also too high. The bottom line is that there is little incentive to encourage replication, more so in a narrowing and highly competitive funding ecosystem. However, some kind of replication happens almost on a daily basis in our labs as we adopt techniques described by others and try to adapt them to our own studies. A lot of time and money can be wasted when the original article does not provide enough detail on the materials and methods. Sometimes authors (consciously or unconsciously) do not articulate explicitly domain-specific tacit knowledge about their procedures, something which may not be easy to resolve. 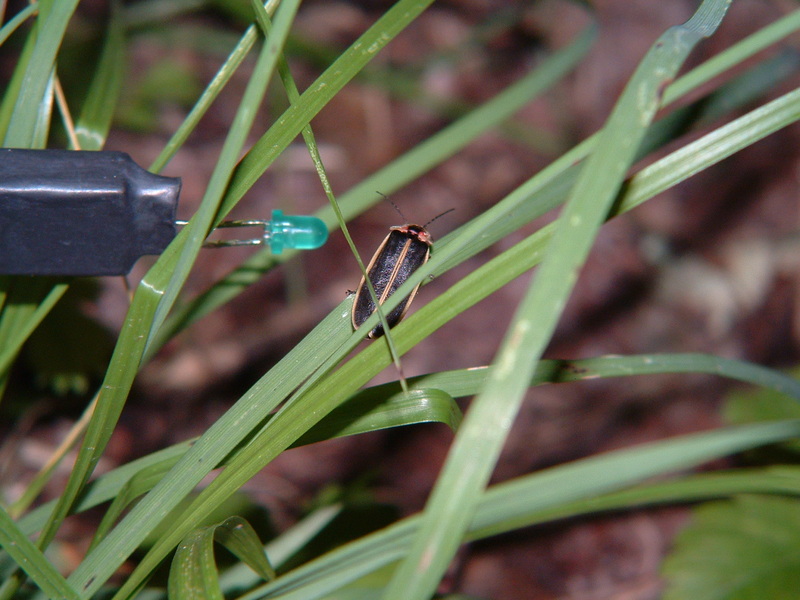 But in other cases, articles just simply lack enough detail about what specific reagents were used in an experiment, like a catalog number, and this is something may be able to fix more easily. 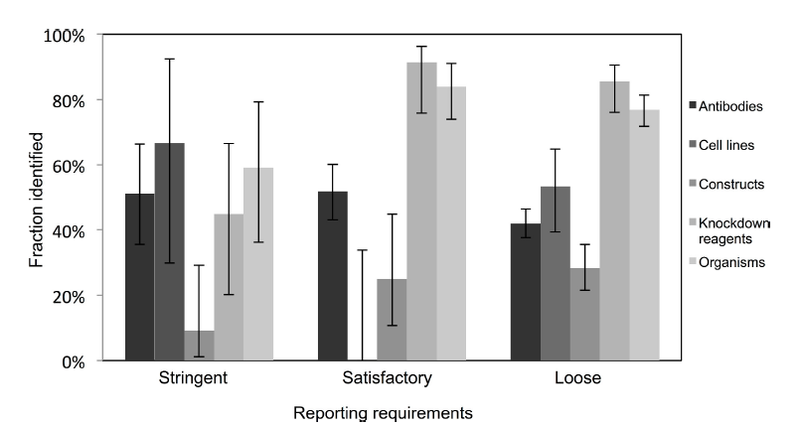 Making explicit the experiment’s reagents would should be quite straightforward, but apparently it is not, at least according to the new study published in PeerJ*. Vasilevsky and her colleagues surveyed articles in a number of journals and from different disciplines and recorded how well documented the raw materials used in the experiments were described. In other words, could anyone, relying solely on information provided in the article, be sure they would be buying the exact same chemical? But not all research papers are created equal. 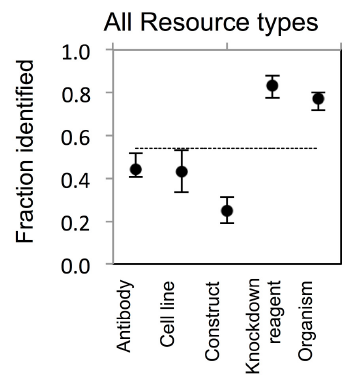 A breakdown by research discipline and by type of resource shows that some areas or types of reagents do better than others. Papers in immunology, for example tend to report better than papers in neuroscience. So, could journals for immunology be better quality or have higher standards than the journals for neuroscience? The authors probably knew we would ask that, and they beat us to the punch. I am not sure I perform myself too much above average (I must confess I am too scared to look!). As authors we may be somewhat blind to how well (or not) we articulate our findings because we are too embedded in the work, missing things that may be obvious to others. Peer reviewers and editors tend to pick up on our blind spots much better than us. Yet apparently a lot that still does not get picked up. Peer-reviewers don’t seem to be picking up on these reporting issues, perhaps they make assumptions based on what is standard in their their particular field of work. Editors may not detect what is missing because they are relying on the peer-review process to identify reporting shortcomings especially when the work is outside their field of expertise. But while I can see how not getting it right can happen, I also see the need to get it right. While I think all journals should have clear guidelines for reporting materials (the authors developed a set of guidelines that can be found here), Vasilevsky and her colleagues showed that having them in place was not necessarily enough. Checklists similar to those put out by Nature [pdf] to help authors, reviewers and editors might help to minimise the problem. I would, of course, love to see this study replicated. In the meantime I might give a go at playing with the data. *Disclosure: I am an academic editor, author and reviewer for PeerJ and obtained early access to this article. I am not sure why, but this week appeared to be filled with news about science to share. All of these are brought to you by the magic of Open Access or the efforts of people in the web to make science accesible to everyone. The study has been published under a creative commons licence (http://creativecommons.org/licenses/by-nc-sa/3.0/) and the data has also been released here. I dont know whether Nature will ever move to a full Open Access format, but I think it is worth acknowledging that at least some of their material is made available withouth a subscription. To read a full review of the article, you can visit David Winter’s blog. Our findings here raise the possibility that string pulling is based on operant conditioning mediated by a perceptual-motor feedback cycle rather than on ‘insight’ or causal knowledge of string ‘connectivity’. As usual, things are not so black and white. You can read the details of the study on the PLoS One site, and Wired Science has a great review by Brandon Keim on the paper. And, if you are looking for interesting blogs filled with science nerd content, then this is the best time to find them. And if all that geekiness was still not enough, then you are in luck. Next week will see Global Ignite Week: Ignite talks in 65 cities and 5 continents (and yes, there is one in Wellington on Tuesday). Ignites are a great presentation format (well, unless you are a speaker since they are really really hard to do well!). If you have not heard one before, there are plenty on YouTube Ignite Channel. If you cannot make it to Wellington, then Auckland will be having on Thursday another Late at the Museum, this time on innovate science. I know, I am now sounding like a tourist guide. One more (an last). If you want to know everything there is to know about <ahem!> me :), thanks to the magic of Bora Zivkovic and The Blog Around the Clock, now you can. There should be a warning or disclaimer before I lead you to this link. Congratulations to our fellow Sciblings who made it to the finals for the Research Blogging Awards 2010. Misc.ience (by Aimee Whitcroft) was nominated for best blog in Chemistry, Physics or Astronomy. The Atavism (by David Winter) was nominated for best lay-level blog. Congratulations to you both (and if I have failed in identifying a sciblogger, please let me know! Funny how we are really good, for the most part, at knowing where sounds are coming from. And it is funny since the ear provides the brain with no direct information about the actual relationship in space of different sound sources. Instead, the brain makes use of what happens to the sound as it reaches both ears by virtue of, well, being a sound wave and that we have two ears separated in space. Imagine a sound coming from the front, the sound will arrive to the two ears at the same time. But if it is coming from the right it will arrive to the right ear first, and to the left ear a wee later. This ‘time difference‘ will depend on the speed of sound in air and how far apart our ears are. Even more, as the sound source moves from the far right to the front of the head those time differences will become smaller and smaller, until they are zero at the front. If one could put one microphone in each ear, one could reliably predict where the sound comes from by measuring that time difference. And this is exactly what a group of neurons in the brain does. The way the brain works is that things on the left side of our body are mapped on the right side of our brains, and things on the right side of our bodies are mapped on the left side of our brains. 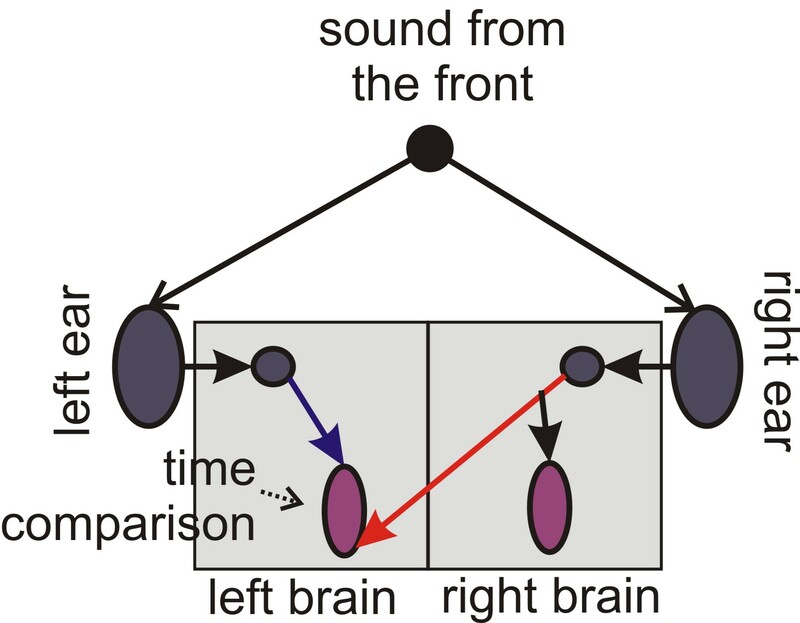 So the ‘time comparison’ neurons on the right side of the brain deal mainly with sound from coming from the left (and neurons dealing with the sound from the right are on the left side of the brain). 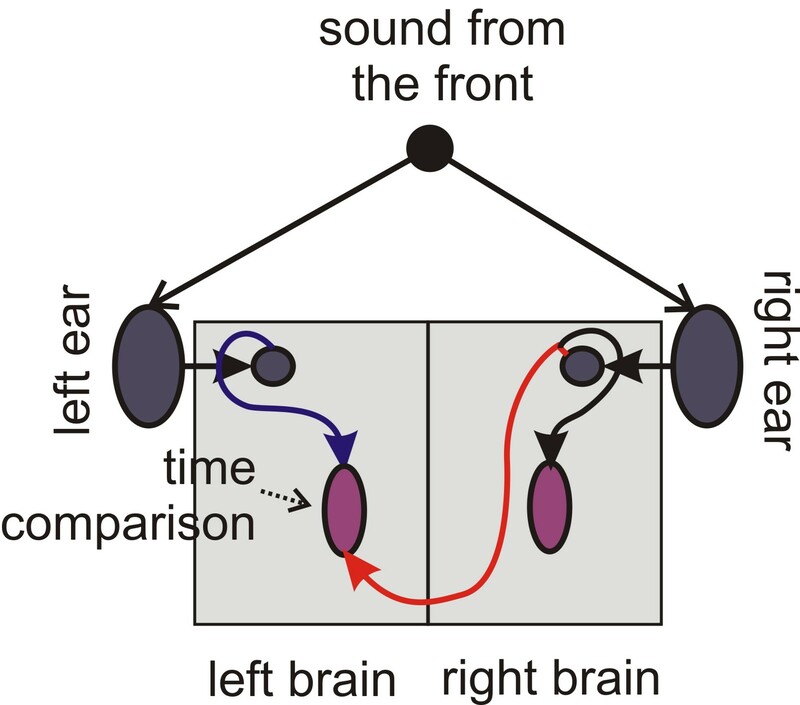 But to do the time comparison these neurons need to get the information from both ears, not just from only one side! This raises this conundrum: the neural path that the information from the left ear needs to travel to get to the same (left) side of the brain will inevitably be shorter than the path travelled by information coming from the other side of the head. So how does the brain overcome this mis-match? And here is where having paid attention at school during the “two trains travelling at the same speed leave two different stations blah blah blah” math problem finally pays off. When a sound comes from the front, the information arrives to each of the ears at the same time. The information also arrives to the first station in the brain (nucleus magnocellularis) at the same time. But time comparison neurons need information from both ears, and the path that the information needs to travel from the right side to the time comparison neurons in nucleus laminaris on the left side (red arrow in figure 1) is longer than the path from the same side (blue arrow in figure 1). However, when you look into an actual brain, things are not so straight-forward (sorry for the pun). The axons from nucleus magnocellularis that go to the time comparison neurons on the same side of the brain take a rather roundabout route (as in figure 2). And for long we assumed that such roundabout way was enough to make signals from the left and right sides to arrive at about the same time. When Seidl, Rubel and Harris actually measured the length of the axons (red and blue) they found that there was no way that the information could arrive at about the same time and that the system could not work in the biological range. But this problem could be overcome (back to the old school problem) by having the two trains (action potentials rather) travel at different speeds. And this is something that neurons in the brain can relatively easily do in two ways: One is to change the girth or diameter of the axon. The other is to regulate how they are myelinated. Myelin forms a discontinuous insulating wrap around the axon, which is interrupted at what is called the Nodes of Ranvier. The closer the Nodes of Ranvier are, the slower the action potential travels down the axon. What the group found was that both axon diameter and myelination pattern were different in the direct (blue) and crossed (red) axons. When they now calculated how long it would take for the action potential from both sides to reach the time comparison neurons in nucleus laminaris, adjusting speed for the differences in the two axons, they found that yup, that pretty much solved the problem. The regulation of these axonal parameters within individual axons seems quite remarkable from a cell biological point of view, but it is not unprecedented. But remarkable indeed, considering that this regulation needs to adjust to a very high degree of temporal precision. I have always used the train analogy when I lecture about sound localisation, and always assumed equal speed on both sides. Seidl, Rubel and Harris’ work means I will have to redo my slides to incorporate differences in speed. Hope my students don’t end up hating me!